Is your ink or toner running low? Don’t panic, Cartridge Depot has now opened its doors and is welcoming customers who are eager to save money on their printing costs. Cartridge Depot specialise in saving their customers money without compromising on quality. At Cartridge Depot you will find a wide array of cartridges stocked including original, compatible and re manufactured ink and toner cartridges. To help you save even more money Cartridge Depot can offer a discount on your purchase of any cartridge on return of your empty one (depending on cartridge, contact us for more info). 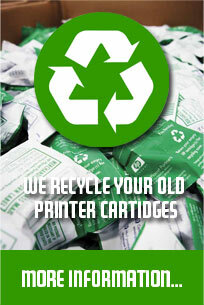 In turn saving you money and the environment, as all empty cartridges are recycled. And what’s more you will be dealing with industry trained specialists who are on hand to help and give support on all your printing needs. At Cartridge Depot we strive to help our customers save money, but it will also help them save the environment by recycling all their empty printer cartridges. In addition to this we run a recycling scheme for local businesses, charities and schools returning a donation on collection of empties. We do and can supply nationwide including our popular surrounding areas, we supply ink and toner cartridges in Milton Keynes, Luton, Northampton, Peterborough, Dunstable, St. Neots, Cambridge, Biggleswade, Sandy, Huntingdon, Leighton Buzzard, Olney and Ampthill to name just a few. Contact us to see how we can help you or your business wherever you are based in the UK. Here are just a few things Cartridge Depot can offer you! Come in and be amazed with our incredible prices! Come in or order by phone now!